let me be the first to say, very nice! I love it. It shows off your new found photoshop skills:) I know what you mean about being hard to let go of the familiar. I got called a scaredy cat the other day for not going full throttle at photoshop. Oh and I haven't forgotten your second photoshop lesson either, just busy but I will get to it later this week. Will probably use and old photo again though. if you like it yourself then it's done.one thing you can do is do another banner.it's not what others think it's what you like.it's done now get on and give your fans more photo's. me being one.go on use the tools given you.???????? I like it too. Change is good. I love the texture of your new banner. 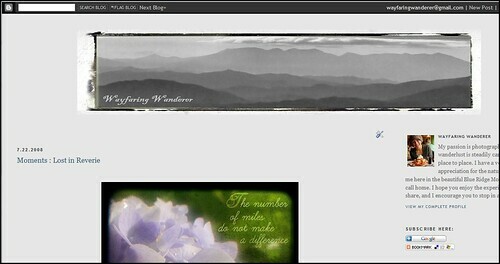 I'm assumning the old banner (which I also love) is of the Blue Ridge Mountains, where you live. So it's interesting that your new banner has a globe, which hints at a broader scope and perhaps represents the direction in which you want to wander. Love the new header - you have come so far! I like it, too. I'm not always comfortable with change myself, but I think it's good to shake things up once in a while. It's the first thing I noticed... really changes the feel of your site. Great treatment on it! You're so skilled! I have trouble letting go of your beautiful mountains photo... it let me dream a little every time. Congratulations on your bravery to change your first header, which I loved, btw. I'll make friends with the new one! I don't know anything about anything technological, but that header is cool. liss: A scared y cat!? What.....you....I don't believe it! please sir: Time....it's a funny thing eh? e.marie: You're right, it is good to shake things up a bit, I'm all about that! laura: listen to you.....it doesn't change the feel, I thought that too, although I find myself not wanting to change the background color!? THANK YOU ALL SO MUCH, I TRULY APPRECIATE THE SUPPORT.